Words to Sweat By: Inspirational Fitness Towels We Love! Words to Sweat By: Inspirational Towels We Love! The following is a sponsored post for Words to Sweat By in exchange for their support of our Fit Bottomed Girls’ Weight-Loss Challenges. For our sponsored post policy, click here. Here’s the deal. We review a lot of products. But when one is not only functional but also inspirational, we fall in love with it so hard that you can’t get us to stop yammering on about it. Which is exactly the case with all of the fitness accessories created by Words to Sweat By (and why we were thrilled when they wanted to give goodies to our FBG Weight-Loss Challenge winners!). This amazing company takes fitness accessories and makes them fun—thereby exercising a person’s funny bone along with the rest of them. 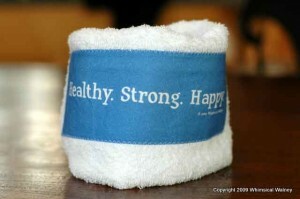 Every fitness towel has a colorful appliqué of a motivational mantra. While some are serious and some are sassy, all of the workout mantras are highly effective in staying focused when thrown over your cardio machine to remind you why you’re working to stay healthy and fit when those last 10 minutes seem like for-ever. One-hundred percent cotton and large enough to mop the sweat off your brow without feeling like you’re hauling around an over-sized bath towel, these are also packaged in an organza bag for easy gift-giving and to promote zero-waste packaging because the bag can be reused (potpourri, used to give another gift or as a treasure keeper for a kiddo).